St. patrick's day cake pops! 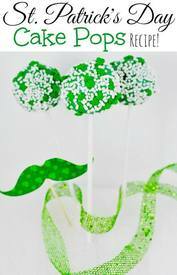 Make this St. Patrick’s Day Cake Pops Recipe for your St. Patricks Day Party and impress all of your guest! This is a great recipe to keep on hand all year long, just change up the colors of icing and sprinkles! These are sure to be a hit at your St. Patrick’s Day Party! I love that they are super simple to make too! Plus, these are a great treat for kids and adults! Make them ahead of time and put them in the freezer! It is a great way to start your party preparation early!